Growth Habit: Ox-eye daisy may reach a height of about 100cm, but more typically averages 30:60cm. It grows quite densely due to stems, which touch the ground often, take root and form new plants. Type of Plant: An erect perennial herb. Flowers: Ox-eye daisy flowers between September and December. The flower is a typical daisy type, with white petals and a yellow centre. Fruit/Seed: The seeds are 1.4-2.5mm long and 0.6-1.2mm wide. They have distinctive raised and rounded slender ribs that run from base to tip. Dispersal: Seed is dispersed by soil movement, wind and water. New plants arise from stems touching the ground. 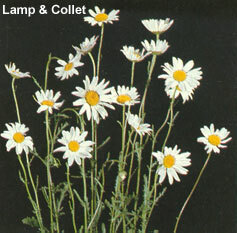 Distribution: Ox-eye daisy prefers temperate regions, disturbed sites and heavy damp soil. It is most commonly found along roadsides in Tasmania. Ox-eye daisy has minimal economic impact in Tasmania, however as it grows very densely it is capable of displacing native plants. Single plants can produce 5000-8000 seeds. Although not readily grazed it can contaminate milk if consumed. Cultivation (early flowering stage- Sept). Cultivation to at least 15cm exposing and killing root system. Shallower cultivation over 2 or 3 years kills seedlings and regrowth from root pieces. Grazing (autumn and winter). Sheep may help eat young plants. Improve pastures to improve competition. Herbicide (spring, summer). Herbicides registered in Tasmania include Dicamba, amitrole, MCPA and glyphosate.